There are many jobs that need to be done on the AACORN Farm. Some are rewarding, like feeding the affectionate and playful goats. Others are also rewarding, but in a very different way, like digging up the muck from a chicken pen. Nasty, stinky stuff, the result of a pen that's under the leafy canopy of nearby trees. Constant shade never allowed the chicken waste to dry in the sun, leading to a deep mess. Greg Bassett, 19, is willing to tackle both jobs -- but he likes working with the goats better. And on a warm early August day, he's eager to put down the shovel and wheelbarrow to show off the goats. He grew up in the suburbs of Kalamazoo and Portage, and never knew farm life. "When I was little, I used to be afraid of dogs and cats," he says. He grew out of that, started participating in Aacorn work at 17, and "now I have this big huge connection with animals." Bassett says the female goats are the best; "sometimes they get out, but they're very sweet, very cooperative." The male goats, however -- "Don't get me started on Zeno. He's the stinkiest goat I ever met." He likes farm rescue pig Kevin Bacon and even Momo the barn cat. "I really like working with almost all the animals," he says. "It's been a tremendous, fantastic experience." AACORN (Autism Agricultural Community Option for Residential Needs) is a farm environment for adults with autism. Program director and board member Liz Farner, M.D., calls it "farm therapy." "I'm a pediatrician by training, but I've always been really interested in mental health," Farner says. AACORN program director Liz Farner and program participant Greg Bassett. Photo by Mark WedelShe used to work with young patients at a psychiatric hospital with its own dairy farm. "I'm just a big animal lover, so we used to take the patients down and work with the patients and the animals, and just the difference in their demeanor, and how it brought them up and made them respond, the whole experience was really powerful for me." 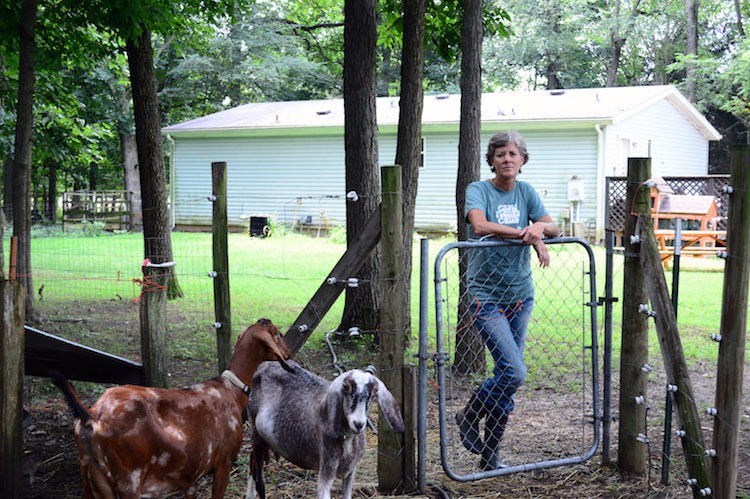 Farner hoped to someday work at connecting animals with people "who have trouble connecting to the world," she says. "The acceptance of the animals, that's been well-established that that helps people connect with each other and themselves," Farner says. People with autism spectrum disorder (ASD) have a range of disabilities that, typically, can make it hard to connect, to form social bonds, and to cope in sensory or emotionally stressful environments. The program serves 15 adults, five per session with two sessions a day. AACORN is on a parcel of land on 25th Street near Long Lake, which they rent from the farm cooperative Lake Village Homestead. "It's beautiful. It's pretty quiet. A lot of room for whatever you could dream of," is how staff caretaker Chapin Cole describes it. Among their program participants, Cole says, "we have a wide range of disability. We have some real higher-functioning and lower-functioning, and all in between. So we are able to tailor to each participant what they like, what's good for them, what they're willing to do." No one is pushed to do what they don't want to do. "We never have to sit here and say, well, this needs to be done and you have to do that. We are always able to find someone who's ready and willing to do what we need to get done." The work is educational and therapeutic. But, for example, that nasty smell from the chicken coop -- could it be overwhelming to a person with autism? "Some of them couldn't handle it. And some of them can't do physical work like that, either," Cole says. One participant, "when he gets overstimulated he hits, he hits walls and yells and stuff." But they discovered that he's great at egg washing. Another has full-time employment outside of the farm, and is willing to do jobs on the farm like dishwashing. "He's able to do that independently, so when he does something like that independently you're able to praise him," she says. "He lives for that praise.... When you find stuff that they can do, they feel great about that." Work with the animals is the most-rewarding, Cole says. "For almost all of them, you can see their attitude change when they're with the animals. They feel understood." Participants get to go out into the community to help sell, or donate, their goods. But Kevin Bacon lives like a king, with no worries. Products of the farm do not include meat -- though some goats sold may have been for eating, Cole and Farner say. They get "a little bit" of money from selling eggs, goat milk and cheese, and soap, Farner says. AACORN soap is sold at the Kalamazoo Institute of Arts gift store and the Nature Connection. Produce from their vegetable garden and other products are donated to the Feed the World Cafe and the YWCA. Then how does this farm bring in an income? Cole sings to a made-up tune, "Donations! Donations! Donations!" "Participants do pay, a little bit, mostly on scholarship," Farner says. Their goal is for the program to be free for all, through grants and scholarships. AACORN started in 2009 and achieved nonprofit status in 2013. Farner says it was motivated by a group of parents of adult children with autism, looking for an alternative to the usual activities that clinics and residential homes offer to adults with disabilities. Usually, "they get to go on outings; bowling, the mall, that kind of stuff." Otherwise, "They watch a lot of TV and they sleep a lot," Farner says. Farming offers a quiet rural environment, opportunities to work with animals and to see the results of their work that they could be proud of. "Instead of just kind of a life, they have a life with purpose," Farner says. Farner, sitting at a picnic table near AACORN's rabbit hutch, with the only man-made sounds coming from the radio motivating the digging in the chicken pen, says, "I could not imagine going back and working in a clinic at this point in my life." Are there problems associated with keeping people with autism in a rigid clinical environment? "Yes -- I'm hoping AACORN will avoid the rigidity" of clinical settings. "I'm hoping, by staying independent we can keep our organic nature, and keep it less administrative, and more hands-on," Farner says. AACORN is independent "of any federal or state funding. Or any funding that people get for disability," Farner says. If they accepted such funds "there would be a lot of things that we could not do here." She wants AACORN to stay independent, "but that will be a challenge because fundraising will be a constant thing, unless somebody gives us a whole bunch of money and we just have an endowment at some point." Lake Village has been a good home for AACORN, Farner and Cole say. They have use of a small house and a few buildings on a small plot of land. Staff often take participants on long walks throughout the rest of Lake Village, visit neighbor farms' horses and cows, go fishing in Long Lake. Back in their early years, AACORN organized trips out to Tillers International's Scotts farm. Within this next year, Farner hopes, they'll go back to Tillers to stay on their own 40 acres, with a barn, and a larger farmhouse. AACORN program director Liz Farner. Photo by Mark WedelThey've been planning to purchase the land at Tillers for "a really long time. We've been working on closing the property now for a year and a half," she says. With more space and larger indoor facilities, they could double the people served. They could use more space for new people, because, Farner says, "most of the time, when people come to AACORN, they really don't leave." The farm becomes a part of participants' lives. AACORN's farmers might find milking goats a source of pride, or simply gain a feeling of independence by walking ahead of the group going out to the lake, she says.